Princess Diana aboard the P&O Cruise Liner "Royal Princess." Photo: Tim Graham/Getty Images. With Princes William and Harry in the public eye now more than ever — thanks, in large part, to the popularity of their wives — we can expect to see a lot more of the late Diana, Princess of Wales’ personal jewellery collection in public once again. Hawk-eyed royal watchers have been keeping tabs on Diana’s jewellery since her untimely death in 1997. Nary a bauble, earring or bracelet has been worn in public by either of her sons’ wives without drawing considerable media attention. Her engagement ring — a diamond and sapphire stunner — has been on Kate’s finger since William proposed to her in 2010. Meanwhile, Meghan has worn an aquamarine ring on several occasions — including her wedding day — that Diana wore in place of her engagement ring after the collapse of her marriage to Prince Charles in 1996. Kate looks down at her engagement ring, which once belonged to Diana. Photo by Chris Jackson/Getty Images. Diana was originally gifted the aquamarine square-cut piece by her friend Lucia Flecha de Lima, the wife of the former ambassador of Brazil to the U.K.
Meghan first wore the ring in public on her wedding day as she and Harry headed to their reception at Frogmore House in Windsor later that night. 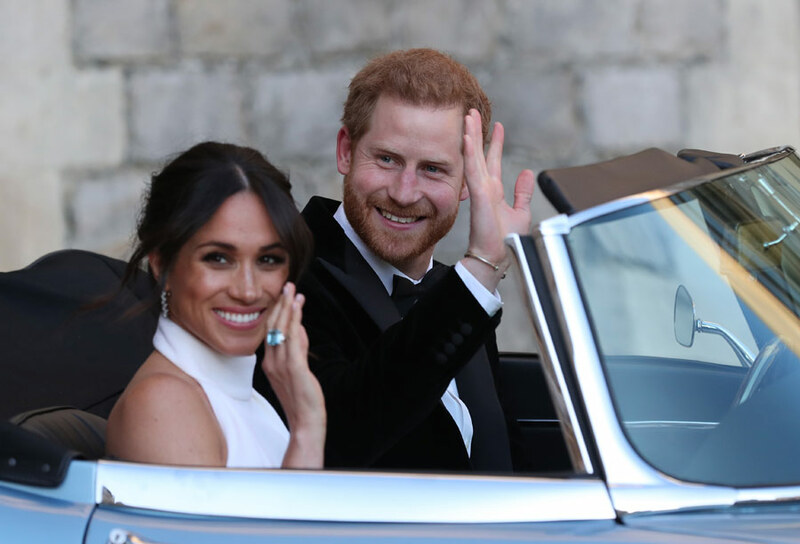 Meghan wears Diana’s ring en route to her wedding reception. Photo by Steve Parsons/ WPA Pool/Getty Images. According to Kay, Meghan has brought the ring with her on the couple’s 16-day Royal Tour of Australia, Fiji, Tonga and New Zealand. And so it was that William and Harry inherited equal amounts of their mum’s jewellery collection when she died — just as she would have wanted — although precious few pieces have been seen in public since 1997. Marriage, however, has changed that somewhat and royal watchers predict the public will be seeing a lot more of Diana’s pieces in the years to come. It’s the perfect way, really, to conjure Diana’s memory into the everyday events that keep her beloved sons — and their philanthropic wives — busy. No doubt, Diana would have been thrilled.